I guess it’s about time I jump on the “Friday Favorites” train, yeah? 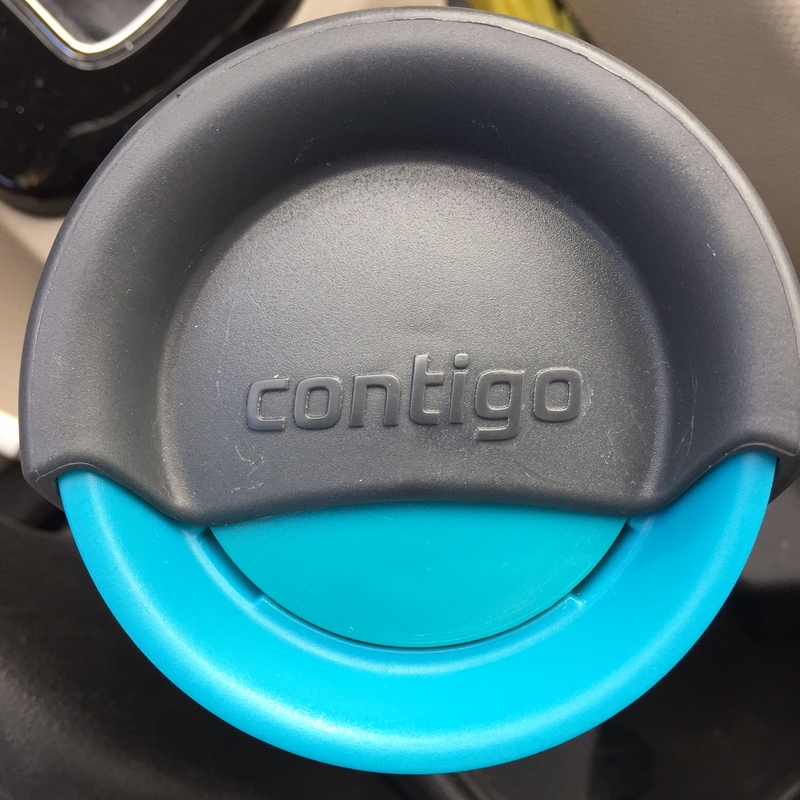 Well, I hope you all enjoyed National Coffee Day yesterday because today, I want to share with you my love for Contigo Mugs. 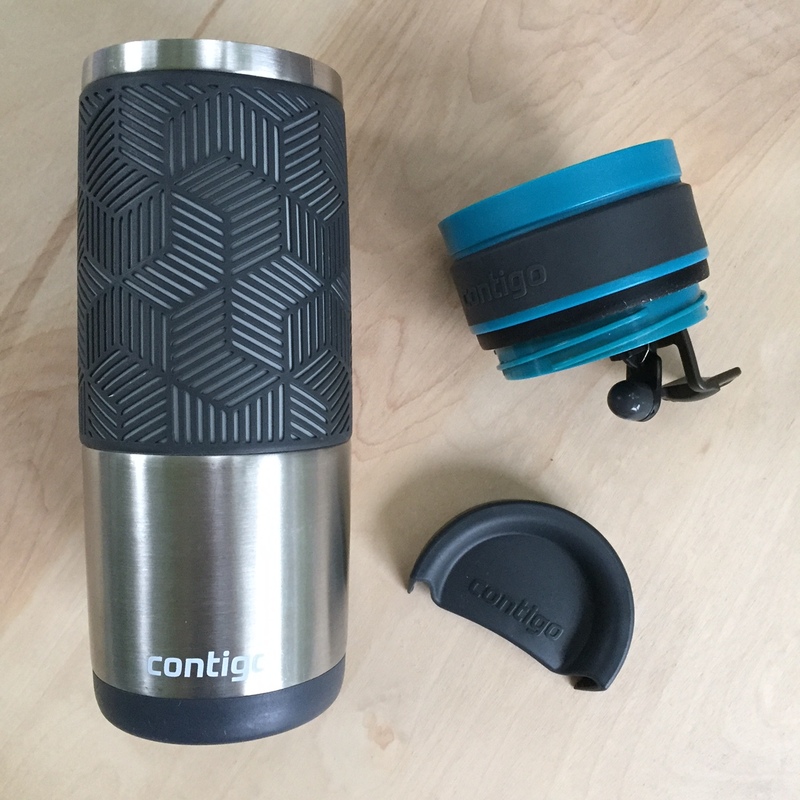 There is no to-go mug on the planet that has come close to my Contigo Transit Travel Mug. I RAVE about this thing. Pretty much to anyone who will listen. Let me tell you, these people have actually gone out and purchased these mugs for themselves or for gifts, and I haven’t heard one complaint. They all love these mugs. I should probably be a Contigo spokesperson or something. 1. You get a good 5 hours of HOT coffee. Say I pour my coffee around 7:30am. At 12:30pm the coffee is still drinkable hot: not scalding but really, really warm. On the opposite end, cold drinks stay really cold. I’d say a solid 10+ hours of guaranteed coldness. 2. Spill-proof. 100% no spills. There is a secure twist CleanGuard™ on top and an AUTOSEAL® button to release when it’s time to take a sip. Too may times have I toppled over my coffee mug in tow or they’ve leaked onto (of course) a white t-shirt. Not with this mug! 3. Easy cleaning. It comes apart in 3 pieces; easy to take apart, easy to put back together. A quick rinse, or run the top through the dishwasher, and you are good to go. Done and done. 4. No handle, which means it fits nicely into a cup holder. This, is a big deal. 5. Price. You can snag one of these mugs for around $22.95 on Amazon. Worth every penny. In fact, I would have paid more for it. 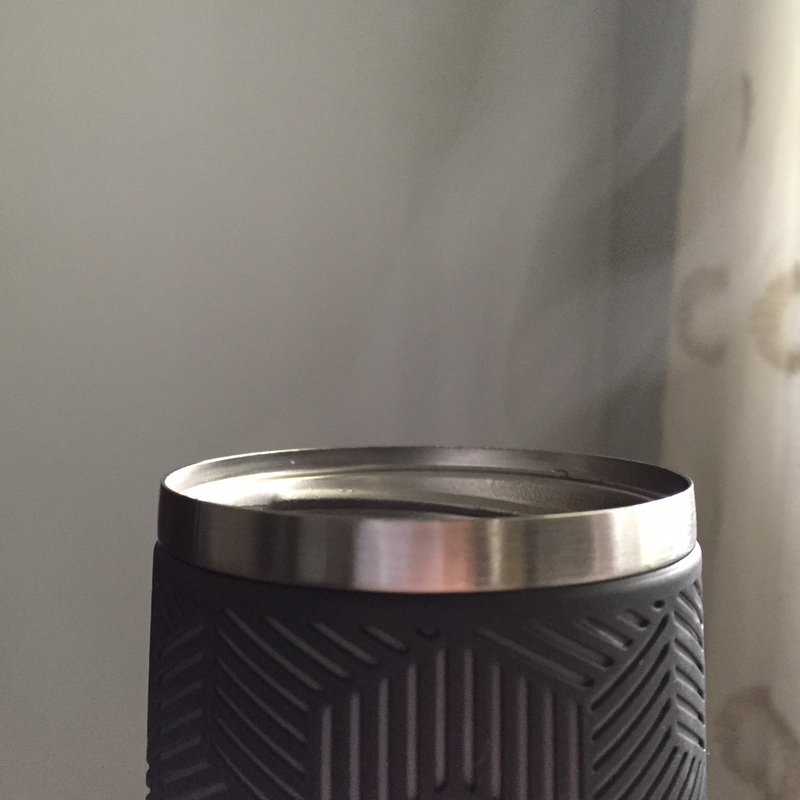 I believe the Contigo website called this mug “the Holy Grail of travel mugs,” and I couldn’t agree more! 6. Last, but not least, I like the overall look. 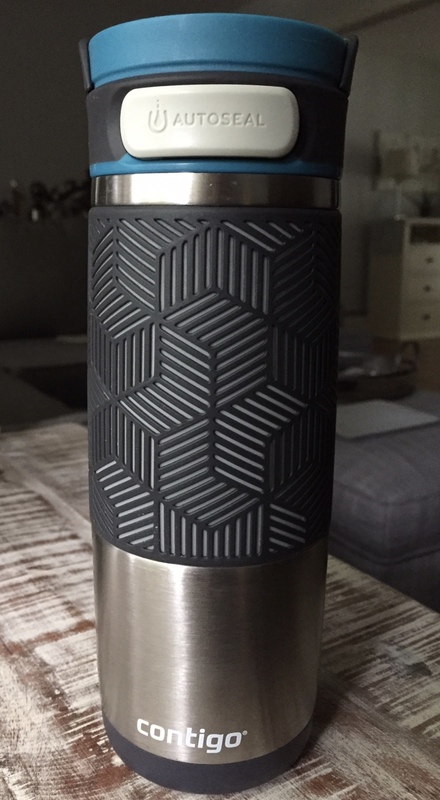 It’s made of stainless steel and, for this specific mug, I like the grip pattern and blue/gray combo. There are two other colors in this style to choose from. For all my coffee lovers out there, you know the importance of a good mug. 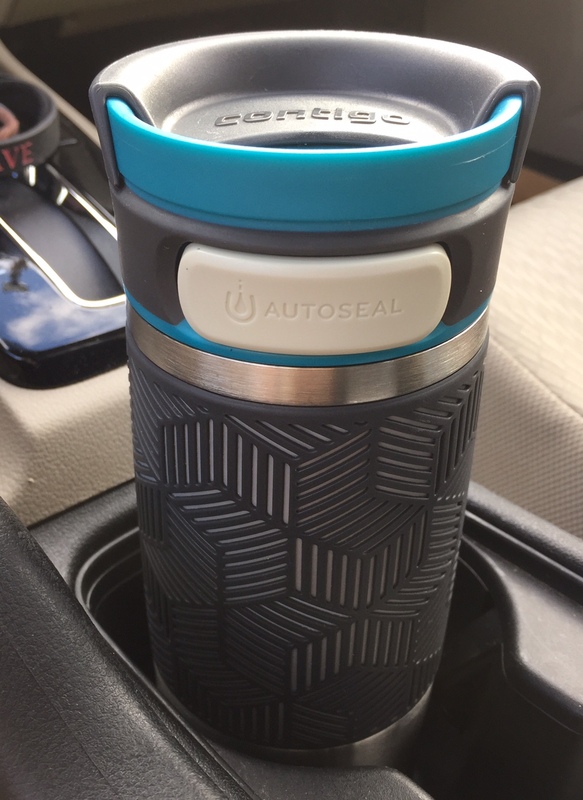 If you are looking for a good quality travel mug, I highly recommend the Contigo brand. I included some links below if you wanted to scope out some more colors and styles. They even have water bottles too!